Heat oven to 350°F. Line 15x10x1-inch pan with foil, leaving about 2 inches of foil hanging over sides of pan. In large bowl, stir together flour, brown sugar, cocoa and egg. Cut in 1 1/4 cups of the butter, using pastry blender (or pulling 2 table knives through ingredients in opposite directions), until crumbly. Stir in walnuts; reserve 3 cups of the crumb mixture. Press remaining mixture firmly in bottom of pan; sprinkle with 2 cups chocolate chips. Bake 15 minutes. Meanwhile, in heavy 2-quart saucepan, melt caramels with sweetened condensed milk and remaining 1/4 cup butter over low heat, stirring constantly. Pour over crust. Top with reserved crumb mixture. Bake about 20 minutes longer or until bubbly. Cool completely, about 2 hours. In small microwavable bowl, microwave 1 cup chocolate chips and the shortening uncovered on High 1 to 3 minutes, stirring halfway through heating time, until melted and thin enough to drizzle. Drizzle over bars. For bars, cut into 12 rows by 6 rows. Place bars in decorative mini muffin cups. It makes serving a snap. 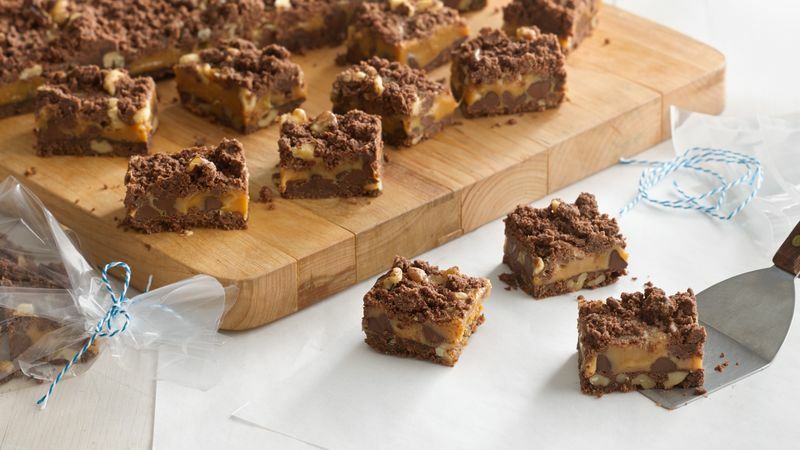 Instead of walnuts, use pecans for a “turtle” flavor combo bar. Bars can also be baked in a 17x11x3/4-inch pan; decrease first bake time to 13 minutes and second bake time to about 18 minutes or until bubbly.